Veterans Day is the quintessential time to focus on honoring those who have sacrificed so much. It is the one day of the year when all veterans should be honored and remembered. If you are looking for a parade, a Flags Across America event, or other community activities, here are some of the most anticipated Veterans Day celebrations for 2018. 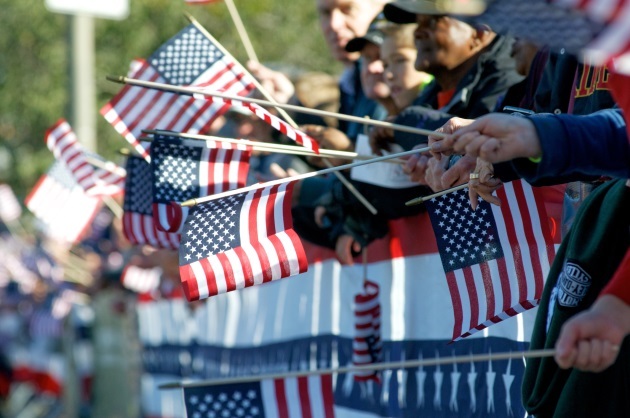 Auburn, Washington, is home to one of the largest parades for Veterans Day to be held anywhere. More than 6,000 parade participants, including 200 military units and over 30 high school marching bands will be in attendance. As a special event, check out the Curb Competition. Those parade goers who cannot participate are welcomed to decorate their curb as part of an annual competition. If you have the chance to venture to Arlington, Virginia, for Veterans Day, do so. On Veterans Day, the Arlington National Cemetery typically has about 5,000 attendees. These visitors can participate in the remembrance ceremony held at the Memorial Amphitheater. Each year the nation’s cemetery also hosts a wreath-laying ceremony for this special holiday. This is a formal, solemn ceremony that takes place at the Tomb of the Unknown Soldier. Ceremonial units from the military are on hand, as well as the president or his designee for the laying of the wreaths. If you plan to attend either of the events, prepare in advance with the business casual dress code for public wreath ceremonies. Both the wreath-laying and memorial ceremony are free and open to the general public. For those of you living in the Midwest or Central U.S., there is a whole week’s worth of festivities for Veterans Day. In Branson, Missouri, the events run from Nov. 5 to 11. Along with the annual Branson Veterans Day Parade in Downtown Branson, there will be celebrities on site. Watch Lee Greenwood, the Oak Ridge Boys, Wynona Judd and The Big Noise, and many more acts live on stage. If you are in Branson midweek, on Nov. 8, there will be several events taking place. A Navy memorial service, as well as a mini-reunion for medics, nurses, and combat vets will take place after a time for prayer in the morning. On Thursday night, the Fourth Annual Spirit of Branson Tree Lighting for veterans will take place. This lighting ceremony also features the Military Order of the Purple Heart Tree, which is in the Westgate Branson Woods Resort Marketplace. Then on Saturday, Nov. 10, the POW Network’s 212th Annual Military Gala and Banquet will salute veterans in an extravagant celebration. Since there are certainly more than three top Veterans Day celebrations, we want to include a few honorable mentions. Birmingham, Alabama, holds the claim to fame for creating Veterans Day, while Simi Valley hosts a Civil War encampment each year to honor the military. In the Big Apple of New York City, 200,000 parade goers come out for America’s Parade. Yet it is Bedford, New Hampshire, that really gets the whole family involved. Here everyone from veterans to grandchildren congregates in the town hall to recognize vets for their service. In addition, the Bedford Friendship Quilt Guild hands out handmade quilts to all of the vets in honor of the day. No matter where you are on Veterans Day, there will be a celebration, ceremony, or event for you to attend. In big cities and small towns nationwide, you will find parades, memorial services, and military events. While you may not be able to make it to the biggest Veterans Day celebration for 2018, there is always next year. If you want to make your way to Arlington Cemetery or Auburn, Washington, for 2019, begin planning your trip today.